An introduction to motorcycle engines - OHV, SOHC and DOHC. Bearing in mind that nearly all machines are OHV, the term OHV generally refers to the way the valves are operated, which in the case of OHV engines is by Pushrods. 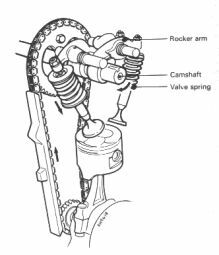 In the diagram, you will see that when the camshaft turns, the Cam (lobe) begins to lift the Cam follower and pushrod, thus opening the valve via the Rocker Arm. Up to certain speeds there are no problems, but beyond that, the weight of the Valve train components are such that they are unable to respond quick enough to the Camlobe passes and begins to fall away. At this point, the valves start to "FLOAT" and damage can occur. Another problem arises in the weight factor of all these moving parts which need to be very strong indeed to withstand the pressures they have to bear. These limitations forced designers to look at other alternatives in Valve operations to improve engine performance. To overcome the weight problem, it became desirable to eliminate as many of the non-rotating parts as possible. 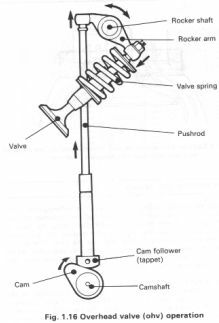 These include the Cam follower, pushrod, rocker and the valve itself. In the case of the valve however, little can be done other than to reduce its weight by careful design and the choice of strong, durable but lightweight materials. In a typical SOHC engine, the camshaft has been moved up and housed at the centre of the cylinder Head between the valves. On some early designs, the camshaft was driven by bevel gears and a driveshaft, but in general, a relatively cheap and simple chain drive from the crankshaft was used. The only moving (Non Rotating parts) left were the Rockers and Valves. Not perfect but an improvement on the older Pushrod method of valve operation. 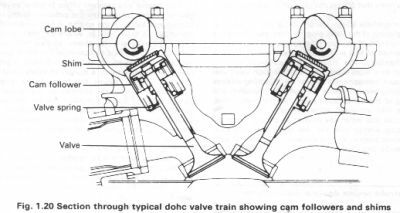 The Diagram (Right) highlights the differences between the OHV and SOHC and how moving parts have been eliminated. And in case you're confused, the "S" denotes Single Overhead Cam as only one camshaft is used - unlike the next refinement that uses two. The DOHC four stroke engine was a further refinement of the SOHC engine, designed to eliminate the only remaining reciprocating weight, the Rockers. 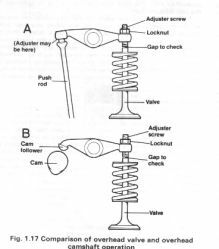 Instead of a Single central camshaft, two are used positioned directly over the Valve stems. Since there is no way an easy conventional adjuster can be fitted, shims (thin discs of metal) are used to set the clearance gaps between Cam Lobes and Valve Stems. So how do you push development still further ? .... One way is make the engine burn more fuel on each power stroke. This could be achieved by fitting a larger Carburettor with corresponding larger valves. But their is a limitation of space on the Cylinder head, and a point would be reached where the larger valves would touch. 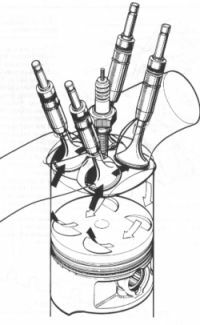 The answer was to introduce two smaller valves to replace each large valve, thus becoming known as the Four Valver. The two valves together have a combined area greater than that of the single larger valve.